Visualization of behavior takes on a quite a different look in Susan Campbell’s piece in Like There’s No Tomorrow. Resistance is decidedly mechanical. I imagine this is how robots would construct a painting. The work is futuristic but yet somehow a throwback to abstract expressionism. On a tin canvas, enamel and Duralar strips are held in position by small magnets suggesting the mutable. While Campbell is no robot, she does employ an altered drawing machine that has a distinct automatic gesture. Affixed to the surface this miniature robo-Pollock first drew the lines represented here in bright enamel. The overlapping threads also call to mind the tradition of mapping, another systematic act of visualization. 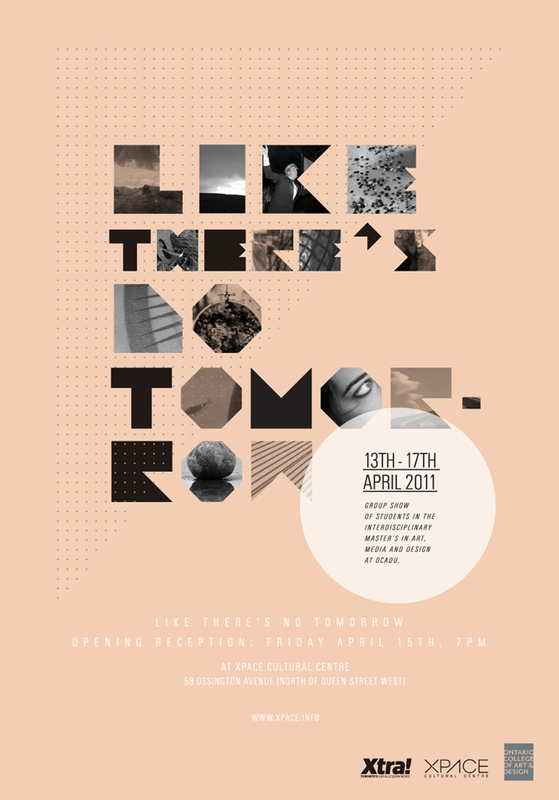 13th -17th April 2011 at XPACE Cultural Centre. Group Show of students in the Interdisciplinary Master’s in Art, Media and Design at OCADU. Two works will be on display in The Nth Degree juried exhibition at the Foundry Art Centre in St. Charles, Missouri. Counting Cars at Esplanade St. Parking Lot (2016) and Zoned Out (2017). The exhibition opens on April 28th and continues until June 9th, 2017.